Thermal Technology’s fiber drawing furnaces are designed for operation to 2400°C with preforms up to 100 mm in diameter. The fiber drawing furnace features a simplified long-life, high-purity graphite resistance element which delivers concentrated heat through a linear graphite tube (available with a split liner for altering the hot zone profile) that serves to protect the element and control inert gas flow. Encapsulated graphite felt insulation surrounds the heating element. Protective inert gas flow routing is simple and effective with top and bottom gas screens, top adjustable iris assembly and bottom water-cooled slide door assembly. Safety interlocked top and bottom plugs permit convenient evacuation and backfilling of the furnace prior to operation. A 30 kVA power supply is also included, complete with a separately housed main transformer in a NEMA enclosure and 10 feet (or longer) of flexible power cables to couple the furnace to the transformer. The fiber drawing furnace MUST be operated with an inert gas (helium, argon or an argon/helium mixture). The gas must be dry and oxygen-free — less than 1 PPM water and oxygen. 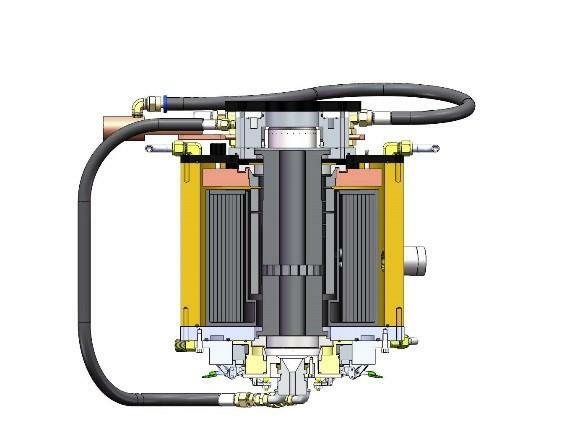 The use of Thermal Technology’s Gas Purification System (Model IGP) is recommended. Top port is closed with a single sliding water-cooled door when there is no preform in the furnace. In open position, the door provides an opening of 2.5” (63mm). The bottom port is closed with dual sliding water-cooled doors with a minimum opening of 0.25” (6mm). 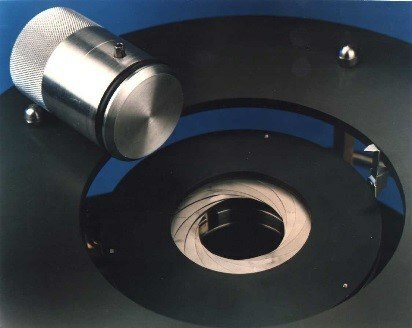 Replaceable iris diaphragm assemblies are available as options for both the top and bottom ports. The irises have an adjustable range of 0.2” (5 mm) to 2.5” (63 mm). Two 1 ⅛” – 16 threaded ports are provided to view the center of the furnace hot zone. Both ports view the heating element through a 0.31” (8 mm) diameter sighting hole. One port is located 45° to the right of the front of the furnace, the other 90° to the left (135° apart). A window is installed in the left port which views through the element. The right port views the exterior of the element for accurate temperature control using an optional radiation pyrometer. This port is plugged but will accept the standard window assembly. Top gas curtain, inlet, with quick disconnect. Bottom gas curtain, inlet, with quick disconnect. Radial purge, inlet. This port admits inert gas into the thermal insulation area for purge prior to beginning furnace heat-up. Radial pressure monitor. This port allows connection of a very low pressure gauge (1 inch water) to monitor interior pressure with respect to the exterior. Gas inlets at top and bottom gas curtains flow to the center of the draw hot zone, exit this area radially, and flow outside the liner tubes to exit at the bottom of the furnace. An additional vent port is provided at the top to allow optional gas flow pattern from the bottom and exiting at the top. All fiber drawing furnace maintenance can be accomplished without removing the fiber drawing furnace from the drawing tower, disconnecting any water-cooling lines or removing any radial windows or control instrumentation. The bottom graphite liner is replaced by removing the fiber drawing furnace bottom door/gas screen assembly. The top graphite liner is similarly replaced by removing the top door/gas screen assembly. The heating element is replaced by additionally removing a top cover plate. The heating element is secured at the top to power electrodes using two taper clamps having four mounting screws each. By removing the top furnace head, the entire thermal insulation assembly can be lifted from the fiber drawing furnace as a one piece assembly. Power cables can remain connected for all operations described. The fiber drawing furnace interior is free of ceramics and other possible contaminating materials. All components are solid, ultra-purified graphite having a typical ash content less than 20 ppm. The fiber drawing furnace assembly is completely sealed with Viton O-rings. Optional end caps are available to allow vacuum purging prior to operation. These solid caps replace the top and bottom iris diaphragms for vacuum operation. Facility sources of operation power and cooling water are connected into this enclosure. Furnace controls are enclosed in a separate bench mounting cabinet which is provided with standard 19” notched rack mounting extensions. Cabinet size is 17” wide x 14″ deep x 10.5” high (430 mm x 355 mm x 267 mm). The power supply range provided allows beginning operation at the higher currents and having voltage reserve available for operating as the heating element ages and its resistance increases. This allows continuous operation without the requirements to shut the system down to change transformer voltage taps. A safety interlock with warning lamp, audible alarm, and operate/reset switch monitors cooling water flow and will shut the system off in case of insufficient flow for furnace cooling. Control cabinet and power supply enclosure are connected with 16’ (5m) of cable. Eurotherm (or equivalent) single channel, automatic temperature controller/ programmer. Mounted in the control console. 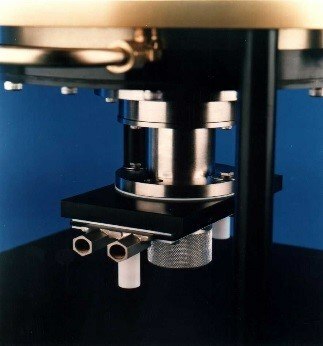 A two-color optical pyrometer with optical head and mounting flange to mate with optical window. Temperature range TBD based on use and model. Electric: The power supply is completely wired for operation from one source of single phase, 150 ampere power. Facility voltage required is 208/230 volts, 60 Hz or 220 volts, 50 Hz. Options for operation from 440/480 or 380 volts, single or 3 phase power are available at additional cost. Water: Furnace cooling water is required at a minimum continuous rate of 4.0 gpm at 55 psid, 65-85°F (14 liters/minute at 380 kPa, 18-30°C). The water should be filtered if it contains sand or other solid matter. Operating Gas: The furnace must be operated with an inert gas — nitrogen or argon/helium. The gas must be dry and oxygen-free, less than 1 ppm H2O and O2. 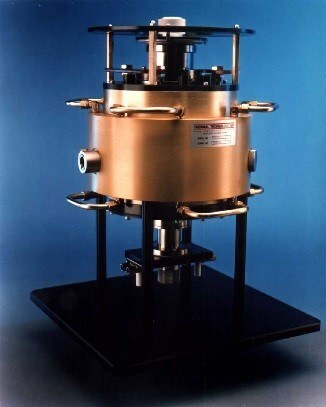 Use of Thermal Technology’s Gas Purification System is recommended. Request a quote for a new product or support on an existing model.